Botany is study of plants and Zoology is the study of animals. Plants are the primary producers in nature. Flora is the plants of a particular region and fauna is the animals of a particular region. The part of the earth and its atmosphere that is capable of supporting living things is the biosphere. Cell is the fundamental unit of Life. His findings were published under the title Micrographia. Anton an Leeuwenhoek was the first to observe free cell such as bacteria, protozoa, blood cells using his home made microscope. All living organism are composed of one or more cell. Cell is the structural unit of life. In 1858, Rudolf Virchow added a third principle to the cell theory that 'all the cells arise from the division of pre-existing cell'. The smallest cell size is of a bacteria. The largest cell is unfertilized egg of Ostrich. Smallest Cell - Pleuro Pneumonia like Organism (PPLO). It is a mycoplasma. Human cells have 23 pairs (46) of chromosomes. 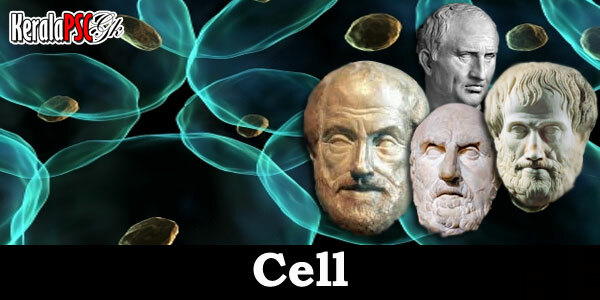 Cell are of two kinds : Prokaryotic and Eukaryotic. Prokaryotic Cell : The prokaryotic cells are the most primitive cells. They occur in blue green algae and bacteria. Prokaryotic cells are characterized by the lack of nuclear membrane and absence of complicated organelles as endoplasmic reticulum, Golgi apparatus, mitochondria or chloroplasts. Eukaryotic cell : Eukaryotes, have distinct nuclei bound by a nuclear membrane and membrane-bound organelles (mitochondria, chloroplasts, lysosomes, rough and smooth endoplasmic reticulum, vacuoles). In addition, they possess organized chromosomes which store genetic material.